Dumpsters, like this one in Oakland, make terrible beds. Just ask one Santa Cruz man who is lucky to be alive today. No matter how bad the economy gets or what you think of free housing, moving into a dumpster is never a good idea. In fact it is a terrible idea. We know they can look attractive with that green, or sometimes flashy red or dreamy blue, metallic exterior. It has a sort of loft type feel going on. But don't be deceived. Even if you are lucky enough to find an empty dumpster in a quiet neighborhood don't let that pull the non-existent wool rug over your eyes. Despite being cold and drafty homes, dumpsters are just flat out dangerous. 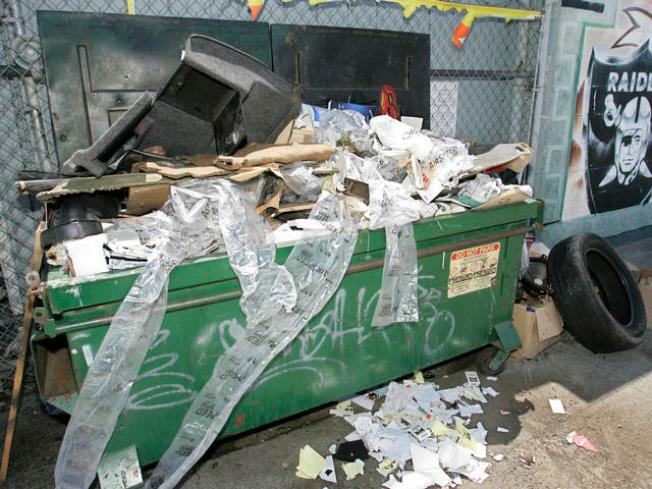 Just ask a Santa Cruz man who thought it would be a good idea to set up shop in a dumpster he found Tuesday morning. He decided to grab a quick nap in his new temporary ocean side home but he was lucky to wake up from his slumber without injury. The dumpster he was sleeping in was actually still being used as a dumpster. Go figure. The man and his belongings were dumped into a garbage truck during a regular trash collection route at about 6 a.m. The driver inside the truck uses controls to move the dumpster and he was not able to see that our friend was sleeping inside. Fortunately for our friend a city collections supervisor happened to be on the ground outside the truck watching the collection and he heard a faint sound from the truck. The woman directed the driver to shut off the truck and the driver and supervisor were able to hear the person yelling from inside. The supervisor called 911 and both fire and police units responded. The fire department used their hydraulic ladder to retrieve the man from the inside the truck compartment. The 48-year-old napper escaped the rude awakening with minor injuries. He was taken to a local hospital where he was treated and released. We are happy our friend escaped without injury but let his story be an example to us all: do not take up residence in a dumpster. After all, despite the fancy name, it still is an over sized garbage can.